February is Black History Month, and the Brooklyn Historical Society will celebrate with a series of events illuminating aspects of Black history, both local and national. The series will begin early, this Wednesday evening, January 30 from 6:30 to 8:00, with a discussion of a vicious crime in 1946 against a Black decorated war veteran that led to President Harry Truman’s order integrating the armed forces, and to the awakening of a courageous white Southern judge, W. Waties Waring, whose decisions helped prepare for the landmark 1954 Supreme Court decision in Brown v. Board of Education. There’s more information, and you may purchase tickets here. Other events in the series are: Black-Owned Businesses: A History of Enterprise and Community in Brooklyn (Tuesday, February 11; Book Talk: Separate: The Story of Plessy v. Ferguson (Tuesday, February 19); Beauty, Media, Money, and More: A Conversation with Tressie McMillan Cottom (Monday, February 25); Book Talk: Force & Freedom: Black Abolitionists and the Politics of Violence (Tuesday, February 26); and The Halls of Hope: Voices from Obama’s West Wing (Thursday, February 28). 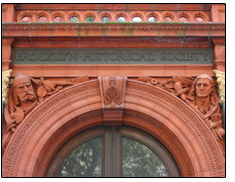 All of these events will take place at the Society’s main location, 128 Pierrepont Street (corner of Clinton). All month, and until March 24, the exhibit Brooklyn Abolitionists: In Pursuit of Freedom will be on display at the Society’s main location.